A game by Kitty Calis, Jan Willem Nijman, Jukio Kallio, and Dominik Johann for PC, Mac, Linux, Switch, PS4, Xbox One, iOS, and Android originally released in 2018. 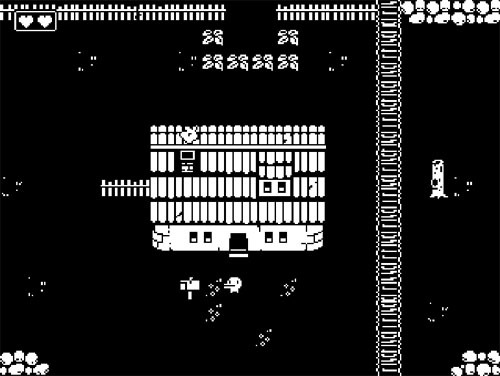 Minit is an open world action adventure that is played out in 60 second increments. 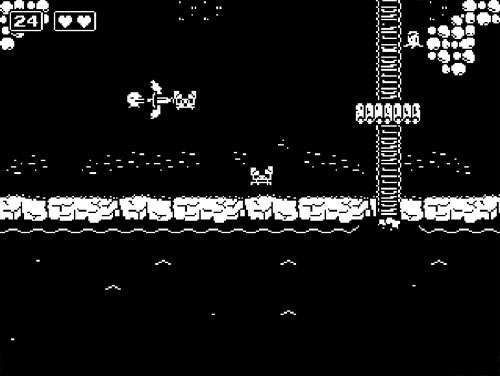 You take on the role of a plucky duck-faced (or perhaps just big-lipped) fellow as he travels through a 1-bit black and white world. Early in his adventure… like a few seconds in, he discovers a sword lying on the beach. As it turns out, the sword is cursed, and picking it up causes a 60-second countdown timer to appear, which begins ticking downward. In the last few seconds, a countdown alarm sounds, and when time runs out, the player character lets out a gasp and drops dead. Fortunately, this is not the end for our hero, as he awakens back in his home, but he still has the cursed sword in his possession, and he still has only 60 seconds to live. He sets out once more, and with sword in hand, he is now able to do things that he couldn’t do before, such as kill wandering crabs and cut through shrubberies that formerly blocked his path. He is able to attack in four directions. There are a few NPC’s within reach of his short life span, and walking into a coffee shop reveals a barista who is complaining that his clientele have dropped off due to all of the nearby crabs. 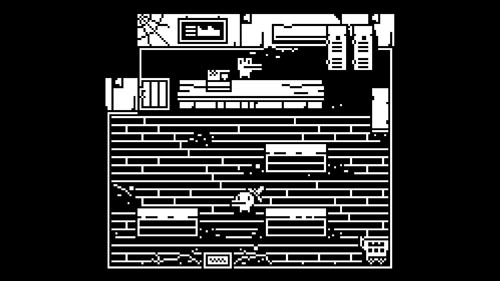 By killing five crabs and returning to the shop, the player is rewarded with a cup of coffee, which gives him the strength to push boxes, further opening the world to him. 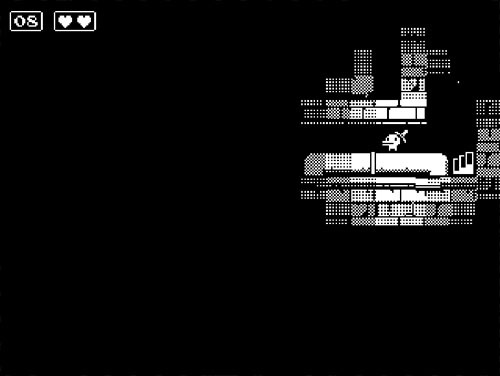 The entire world is built upon such layered level designs, with new abilities gained throughout the adventure that not only open new routes but also make it easier to return to previously-visited areas. 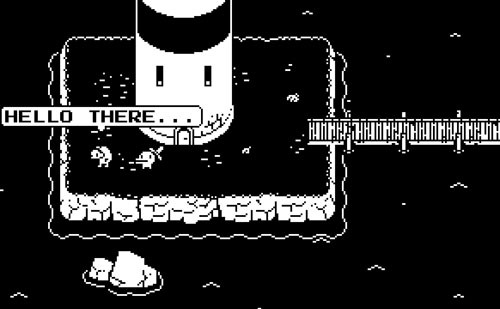 One early gag features an old man standing next to a light house, and when you approach, he begins telling a story. Unfortunately, he speaks very slowly, and he has much more to say than other NPC’s. As such, reaching him without much time on the clock means that it will be impossible to hear his tale before dying. While it may seem like the guy is just rambling, about halfway through his speech, he references a treasure, enticing the player to return upon respawning. The game world is built in a cohesive fashion, with areas connected by waterways and bridges, and lined with beaches and cliffs, and later upgrades allow the player to take shortcuts back to earlier areas. 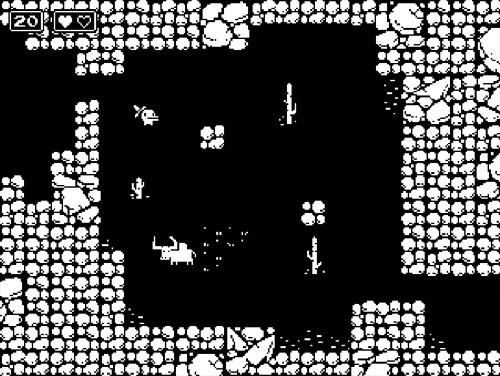 This logical arrangement makes it easier for players to recall which of the single-screen environments connect to each other, easing exploration, which is particularly helpful given that the game does not have a map… the inclusion of which would have severely limited the game’s otherwise rapid pace. There’s even an desert in the east which seems to go on forever, but it holds its secrets as well. Given that the world continues to open to the player as he gains new abilities, it gets tougher and tougher to travel within the time limit, but fortunately there are several homes spread across the world. 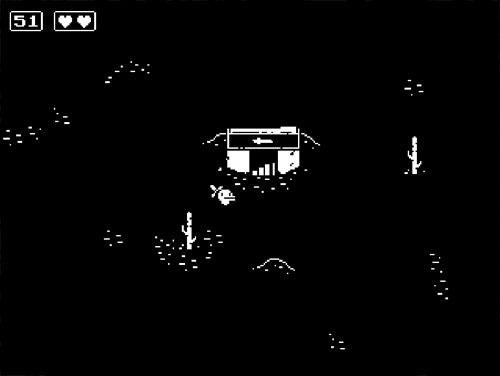 Finding a home allows the player to respawn from that point whenever he dies, and he can revisit previous homes to respawn from there as needed. 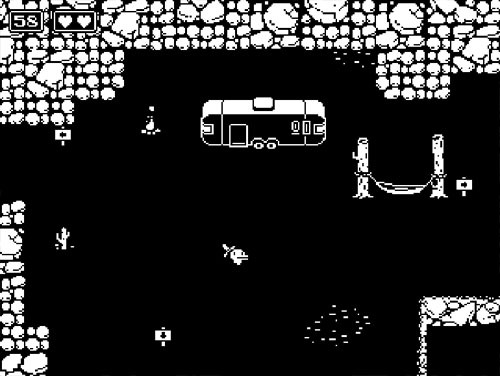 As the player explores the world, he discovers various helpful items that allow him to make progress and/or assist NPC’s, and he also discovers hearts and coins. At the start of the game, the player has only two hearts, which is plenty for the early going as there are only a few creatures that can cause damage, and a small number of active combatants. All health upgrades are optional and are only found by thoroughly exploring the environment, and some are located in humorous ways. The same can be said for coins, which appear in chests and in certain breakable objects, which are not always obvious to the player. By earning enough coins, you can eventually purchase a pair of sneakers that allows you to move much more quickly, which is helpful in a game where you’re always up against the clock. There is quite a bit of humor to be found in interacting with NPC’s, and most progress is made by helping them. 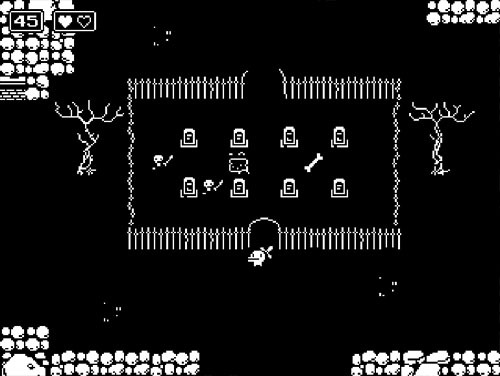 The player constantly finds himself encountering unusual items – like a basement key that opens all basements – and getting into silly situations, like completing a brief haunted house puzzle only to find ghosts around the game world that “haunt you with hints”. In general, the game’s puzzles are fairly straightforward – which is all but required given the game’s fast pace – and mostly revolve around figuring out how to tackle the world’s geography. Players are generally free to explore how they like, and there are loads of secrets to be uncovered. There’s also a quick reset button to speed things along if the player wishes to return home instantly. These design decisions help to alleviate frustration, as players can poke around as they like without penalty, and they know that any given puzzle solution is no more than 60 seconds away. 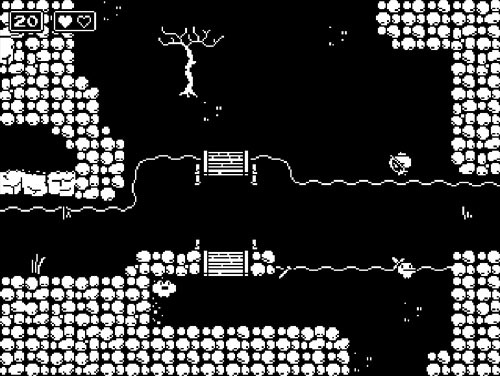 All collected items and important interactions are retained upon death, and players can easily get from one home to another if they want to focus their explorations on a particular area of the game world. Once the game has been mastered, it’s possible to complete the entire experience in a matter of minutes, and the player is graded at the end of the game based on his number of respawns, collection percentage, and time to complete. Eventually, the player stumbles across the nefarious schemes of the game’s villain and must find a way to put a stop to his plans before the final showdown in the game’s single boss encounter. Completing the game opens up a New Game+, allowing the player to return to the world to find what he has missed, or start a second run with a broken sword that only grants him 40 seconds of life, along with some rearranged enemies and NPC’s and only one heart, with no way to get any more. 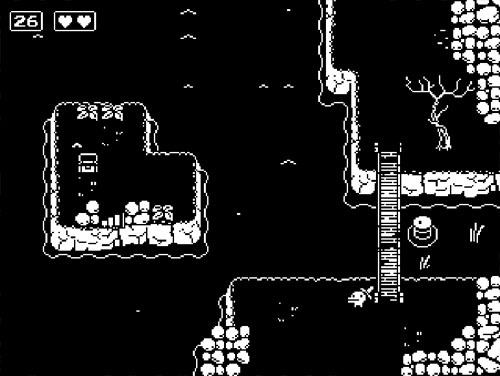 Minit was a collaboration between four developers: Kitty Calis (Action Henk, Horizon Zero Dawn), Jan Willem Nijman (cofounder of Vlambeer), musician Jukio Kallio (Luftrausers, Nuclear Throne, Bleed 2), and Dominik Johann (Dr. Langeskov, The Tiger, and The Terribly Cursed Emerald). The game was published by Devolver Digital, which has published a number of 2D indie games including Serious Sam: Double D XXL, Luftrausers, Broforce, Foul Play, Fork Parker's Holiday Profit Hike, Hotline Miami, Hotline Miami 2, Titan Souls, Not a Hero, Ronin, Downwell, Enter the Gungeon, Mother Russia Bleeds, Serious Sam’s Bogus Detour, The Swords of Ditto, The Messenger, and Crossing Souls.